Improve your appointment schedule processes by automating the connections to your favorite apps and workflow services. 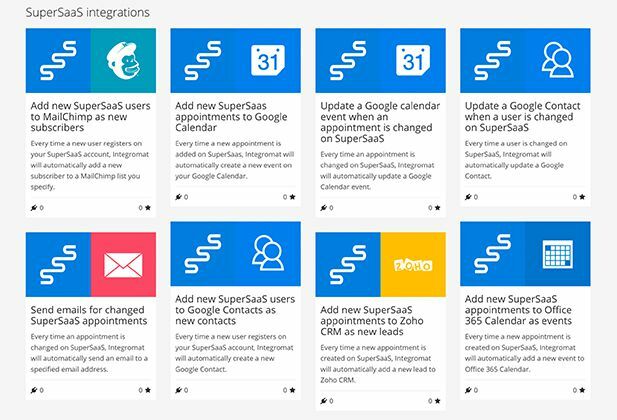 SuperSaaS has always had the ability to connect to other apps in order to streamline your appointment schedule workflow. Recently, we partnered with Integromat.com so that you can connect the apps and services you rely on without having to understand or write any programming code. If you want a new and visually engaging way to connect the admin tasks related to your appointment schedule, take a look at our integration capabilities via Integromat. It’s a quick and easy way to automate processes that you currently handle manually, such as keeping your appointment schedule and personal calendar in sync. Instead of repeating the same tiresome tasks, you can create scenarios that will watch for new events or actions being created in your appointment schedule and transfer them automatically to one (or several) other services. While Integromat is new to the software scene, we are impressed with several unique features, such as how you can watch your data flow processes in real time. It is also not only capable of connecting apps but also transferring and transforming data. Every time a new appointment is added to your schedule, Integromat will automatically create a new event on your Google Calendar. If an appointment is changed, Integromat will automatically send an email to a specified email address. This is useful if you want to add more than one additional email address to your account, such as to several teachers, executives or coaches. When a new user registers, Integromat will automatically add a new subscriber to your mailing list. You can view more examples here. You can also use this tutorial to learn more about connecting your appointment schedule to other useful apps and services.